Before I began this post, this Grandma actually put the word “Halloween” into the search on this website. There are eight previous posts about Halloween and Halloween tips. They include, in my opinion of course, great ideas for grandma to make Halloween wonderful for the grandchildren. So, what, I asked myself, is left for me to say? First, year to year, different events cause different costumes to be those most coveted by our grandchildren. Star Wars this year is it with the new movie coming out. We grandmas must keep up with what is new and happening in our grandchildren lives to remain hip and relevant. Second, different children’s television shows draw our grandchildren attention. Watching television with them, even long distance on Face Time, allows us quality time with grandchildren. They will stay on the telephone and talk about the show as we watch together, especially about the commercials. The mother of our youngest grandchild taught me a trick, an extension of this Grandma’s philosophy of “never say no.” When the four year old says he wants everything on every commercial, the answer is “yes, of course.” She does it. If you say no, a tantrum will occur or the grandchild will know you said no. If you say yes, the young grandchild will forget about the request almost immediately. After all, the next commercial is upon us! It works. I have not yet purchased one of the items on a commercial. I have learned about Paw Patrol, his favorite television show of the moment. You guessed it. He is a Paw Patrol character for Halloween. Of course, Grandpa and I paid for the costume. Third, it really does not matter if Grandma pays a lot or a little for Halloween costumes for the grandchildren or authorizes the parents of the grandchildren to spend a lot or a little to be reimbursed. For a splurge, again, Chasing Fireflies has the best and most elaborate costumes for children. They are expensive. 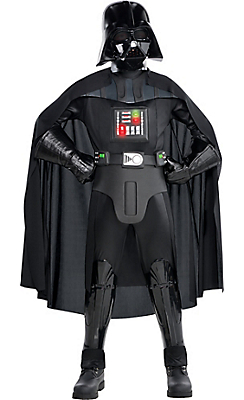 The Star Wars costumes are amazing, coming with boots, accessories, including light up swords and blasters. They are having “friends and family” discount and free shipping right now. The practical side of this Grandma still loves Halloween pajama costumes. What better than to just put the child to bed after the candy high without having to get them out of a costume and into pajamas. The best are at CWDKids. Pottery Barn Kids has the cutest baby costumes and this year has great dinosaur costumes. Fourth, grandma does not have to buy a costume for Halloween. A Halloween card is greatly appreciated by grandchildren. And there are inexpensive treats, as well. This year, this Grandma’s favorite Pottery Barn Kids Halloween treat is a chair back cover in a skull, bat, cat or pumpkin. Take a look. They have the cutest personalized Halloween treat bags. Fifth, give the gift of your time to your grandchild. Time is our best gift at Halloween and all times. Bake Halloween cookies with the grandchild or buy ready made at Williams Sonoma and watch them eat them on Face Time if you are long distance. Consider decorating your own home. Decorate your home with your grandchild. For those of us grandmas into sophisticated Halloween decorations to wow our grandchildren, this year take a look at grandinroad.com/Glam. It is even fun to just look with the grandchild on line, even if you buy nothing.